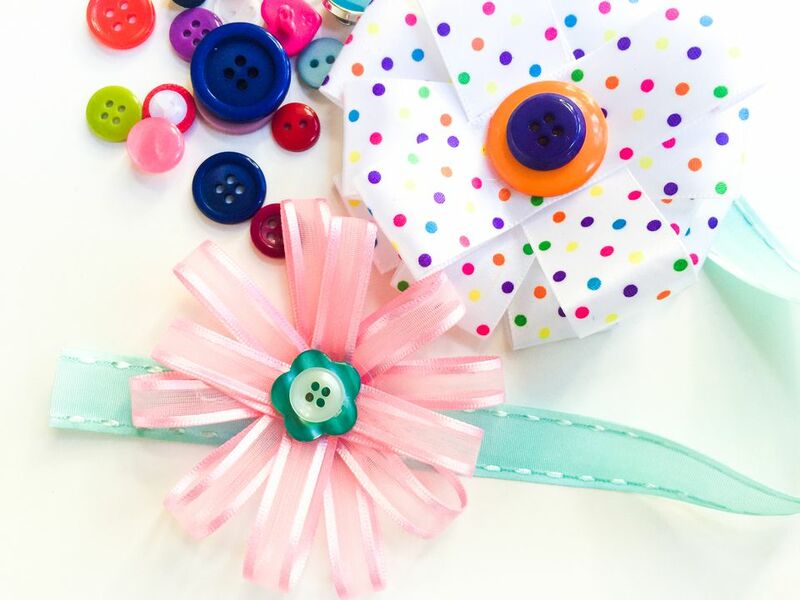 Spruce up wrapped packages, try a DIY brooch, add some flair to a headscarf, or spend a fun crafternoon with kids with this straightforward ribbon flower tutorial. These cuties can add a bit of color and interest to otherwise basic accessories–all while being easy on the budget. Take an afternoon to construct a bouquet of ribbon flowers in a variety of colors and patterns with this step-by-step tutorial. Ribbon comes in such a great variety of patterns and textures and makes for an extremely versatile, and all-too-often neglected, crafting material. Time to get creative! Select coordinating satin, transparent, or grosgrain ribbon (We've used 5/8-inch here, but all sizes smaller than 1-inch will work) and buttons for a polished and professional look. This is a great project for spare buttons and trims–in fact, I found all these materials lurking in my sewing box–but the necessities will also be available at any craft or fabric store. Cut 6 to 8 strips of ribbon, equal in length, anywhere from 4 to 6 inches long. The longer the ribbon, the larger the flower in the end. The more strips you cut, the fuller your flower will be. While this is a super fun project for younger crafters, they may need your help using sharp sewing scissors here and the hot glue gun in later steps. Each piece of cut ribbon will form two flower petals. Dispense a dab of hot glue onto the center of the ribbon, then bend each end in and affix. If you're using satin or patterned ribbon, make sure you glue so that the shiny/decorated side is facing out. Stack your petals, one on top of the other, so that the middles align but the petals are offset. Add a drop of glue in between petals to adhere. Continue stacking until you've reached your ideal flower fullness. Unbend your petals slightly so that your flower looks bountiful. Make any final adjustments to petal placement and length here with an extra dot or two of glue to hold things in place. Add a complimentary button (or two) to the center of your flower to finish the project. This is the perfect craft to use up those spare buttons from new sweaters and blouses that have been gathering dust in your sewing box. Get creative with rhinestones or beads if buttons aren't your cup of tea. Add your ribbon flower to enhance the look of any accessory or gift. These look particularly cute on DIYed embroidered headbands, or as a happy little magnet to brighten up the fridge. 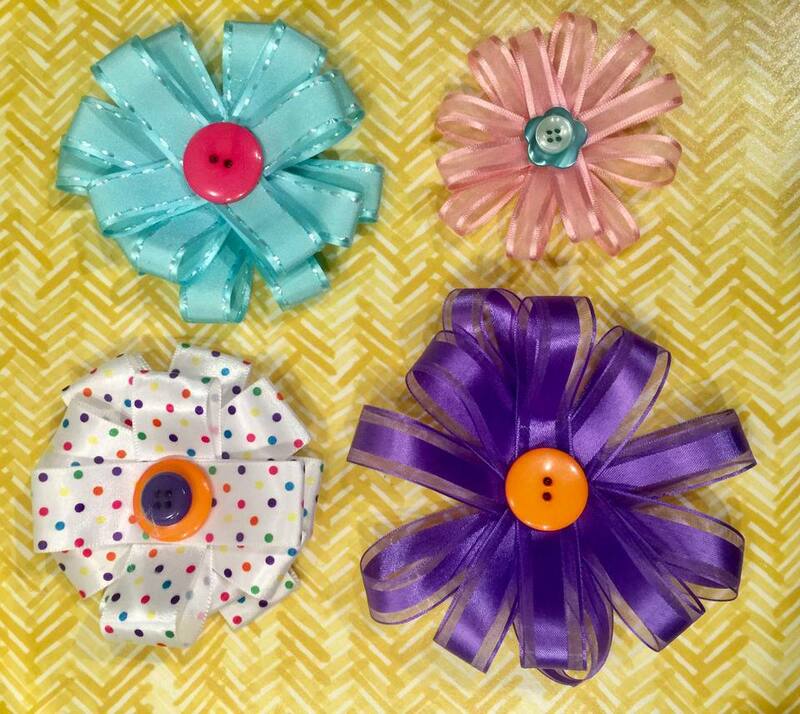 Pro tip: make a whole bunch of at once with leftover ribbon and buttons, then grab a finished flower to add to a project whenever you'd like!